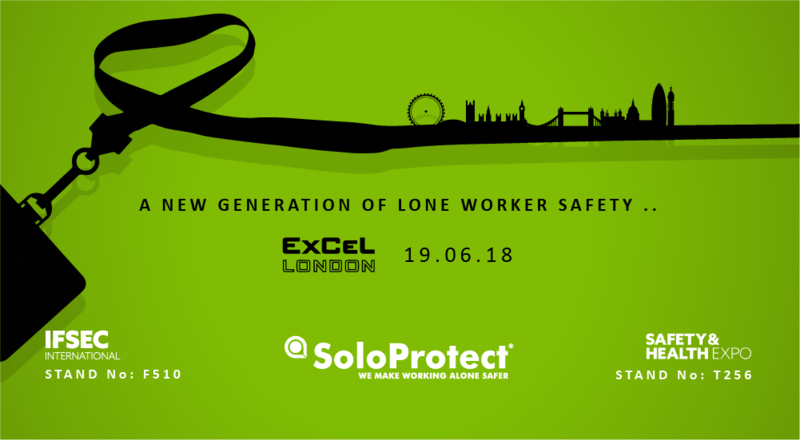 June 19th, 2018 will see lone worker specialists SoloProtect return to ExCeL London, to exhibit at both IFSEC International and The Safety & Health Expo. Hot on the heels of the launching SoloProtect Go and SoloProtect Watch earlier in 2018, this year’s Protection & Management Series will see SoloProtect add to their growing product range, with the major announcement of an exciting, forthcoming lone worker device in both IFSEC and The Safety & Health Expo. Both IFSEC International and Safety & Health Expo bring together key associations, manufacturers, distributors and industry leaders from the world of security, and health and safety – providing a great opportunity to engage with industry professionals, across a wide range of safety issues. The event is also a great opportunity to witness a wide range of guest speakers and seminars, including a talk by SoloProtect’s Managing Director, Craig Swallow. Craig will be exploring how Body Worn Video may affect the future of lone worker safety, and the benefits to both lone worker and first responders. The SoloProtect team will be present across the full three days of the event, and welcome visitors to drop by either stand for demonstrations of the new lone worker device, SoloProtect Insights, and other devices from a broadening product range. To arrange a meeting on either stand at the event, please contact info@SoloProtect.com for more information. The Main Event For Health & Safety Professionals Height Safety Company Pure Safety Group Aquires Checkmate In The U.K.